Posted November 1, 2017 & filed under Safety. In a workplace environment, most employee injuries and property damage can be attributed to a lack of, or inadequate, training. A comprehensive forklift safety training program is one of the most effective ways to combat workplace injuries. There are specific rules set forth by the Occupational Safety & Healthy Administration (OSHA) concerning forklift operator training and licensing. OSHA 29 CFR 1910.178(1) requires that employers provide forklift operators training for vehicle inspection and maintenance. Operators must be over 18 years of age and be recertified at least once every three years. This is an OSHA requirement for every forklift operator within an organization. Every aspect of the forklift operation must be covered, from setting the parking brake to forklift speed. OSHA has a 10-hour and a 30-hour forklift training. The 10-hour forklift training focuses on training the forklift operator and the 30-hour training is geared toward management, safety individuals, supervisors, and other individuals who are responsible for workplace safety. One of these trainings will be required for anyone who operates a forklift. 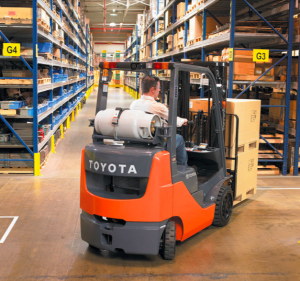 Allied Toyota Lift can provide your forklift operators with one-on-one forklift training onsite at your location or at our dealership. For more about our training options, visit our training site here or contact us today to schedule your safety training class.